Even though we service and repair all types of cars, our mechanics specialise in mufflers and exhaust systems. Regardless of whether you drive a standard Ford or a fully modified vehicle, we know very well what type of exhaust system your car needs. We are a proud family business with over 30 years of experience installing new and repairing old exhausts and mufflers. As a leading service provider of exhausts in Brisbane, we only work with the best brands such as Walker and Pacemaker. 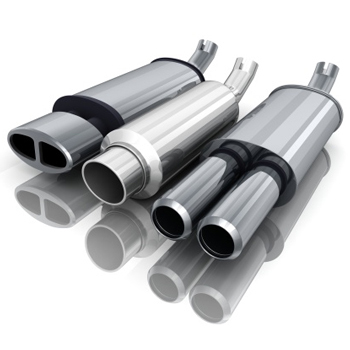 We offer you the best in mufflers, engine pipes or catalytic converters. When a problem occurs, most of our clients notice a noise first. It is important not to ignore the noise and bring the car in as soon as possible. This can prevent increased costs from further damage to your system. In case of an emergency, such as your car exhaust making a very loud noise or parts falling off, always stay calm and collected. Know that our help is never far away. Call us and let us know what your situation is and we will guide you in what needs to be done. We are proud to work with both Walker and Pacemaker exhausts. These two brands supply the Australian market with superior standard and after-market systems, including catalytic converters and oxygen sensors. Both these brands are leaders in their area and use state of the art technology to manufacture the best in exhaust systems. Your exhaust system is essentially used to reduce the noise from the engine. It is made up of 3 parts: pipe, silencer box and exhaust manifold connection. A functioning pipe system brings other benefits such as directing fumes away from passengers, improving fuel consumption and improving engine performance. Part of Australia’s clean air law includes the requirement for all modern vehicles to be fitted with catalytic converter takes. Their role is to change harmful pollutants into less harmful emissions before leaving your car. Australia has emission standards you can read about on the Government website. Download a summary of emission standards for light petrol vehicles. 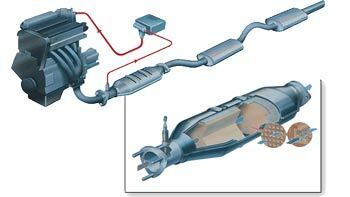 This article describes the catalytic converter and how it works in detail. WHY SHOULD YOU WORRY ABOUT THE CATALYTIC CONVERTER? There are a few main gases that the catalytic converter takes care of. 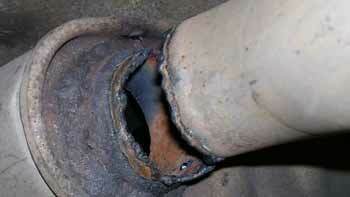 If the catalytic converter is broken, your vehicle’s main emissions will start to leak, harming the environment. Your car alone will not create any damage, the risk comes if the car industry as a whole is not following the regulations. CAN THE EXHAUST GIVE THE CAR MORE POWER? Your car’s power will not be increased by adding a new or performance system. However, it can improve your car’s performance. This article explains some of the parts very well and is worth a read. Most mass produced cars come with a restricted manufacturer exhaust and muffler. They normally have a smaller hole, forcing a smaller amount of air through the small hole. Aftermarket mufflers improve the efficiency of the engine by enlarging the aperture. Extractors are pipes attached to the head and connect to the exhaust system. Their purpose is to transport gases in the most efficient manner, allowing the car to run efficiently. They are sometimes also referred to as “headers”. The extractors play an important role in making your car perform better and lasting longer. At Bowen Hills Exhaust & Car Care, we offer a 12 month warranty on labour and parts for muffler and exhaust services. Our brake specialist will talk you through the process of our brake service.